"$26 trillion debt problem crushing China competitiveness"
While the data presented in the SCMP article seem irrefutable, it is worth examining the argument in greater depth. First, a look at McKinsey Global Institute's Debt-to-GDP Ratio -Country Ranking in 2Q 2014 may help to put the matter in a little perspective. Rapidly expanding debt, especially margin-lending, coupled with insider share manipulation, recently triggered the largest bloodbath in China's stock market history. However, it must be said that debt expansion has become a global malaise, according to the attached February 2015 McKinsey Report. Needless to say, America's debt mountain is legendary. It will be noted that the majority of China's debt is government debt (including local government ) or government-backed (state-owned enterprises). Private debt remains relatively small by international comparison. Those public debt entities are open to backing by Beijing's massive foreign currency reserve. As for competitiveness, we are not seeing other countries usurping China's role anytime soon as the center of the global supply and value chain and the world's largest recipient of overseas directive investment. To hone new competitiveness, China has recently announced a new national manufacturing strategy - Made in China 2015. It would probably take China decades - at least by 2025 - to complete the process of economic transformation. The above is the topic of an insightful tour d'horizon dated 6 July, 2015 of China's ambitions to reclaim the Middle Kingdom's historical centrality in power, influence and prestige by The Red (Team) Analysis Society, a UK-based non-profit global strategic foresight weekly. In particular, the analysis highlights the global economic linkages China is developing by agreeing to build a Pakistan-Iran railway, partnering with Israel in exploiting water and urban sustainability technologies, investing in Greenland for rare earth and forming closer ties with other Scandanavian countries including Denmark, Norway, Iceland and Finland through her Permanent Observer status in the Arctic Council. The latter is anticipation of a future relatively ice-free Arctic, which would open up not only a cornucopia of submerged energy and other resources but also much shorter shipping routes between the Atlantic and the Pacific through the Northern Passage in Canada, the Bering Strait and Russia's northern sea route. (This was heralded in my article The Green Swans of Climate Change in October 2009 in a business magazine "China Ethos"). Along with her One Belt, One Road initiative, China's space exploration program is part and parcel of China's overall strategy for national Renaissance. Nevertheless, it is a little far-fetched to link the two directly as the former is focused on global infrastructural connectivity. Bloodbath in China's stock market belies reform agenda? The Economist (11 July, 2015) points out that China wants to be King Canute turning the tide of the market in face of a looming meltdown. This, the esteemed journal says, exposes the emptiness of China's vow to let the market take center stage. While there is much truth in The Economist's analysis, I am afraid it risks missing the whole truth. China in recent months has been relentless in opening up her financial sector. She has also begun to rein in her over-bloated state-owned enterprises. They are now required to double their tribute to the state to the tune of 30% of profits. Various selected assets are beginning to open for private investment. Despite slowing growth in 2014, new businesses registered an increase of 45.9% or 12.93 million units. 13.22 million urban jobs were created, more than the preceding year. There was a spate of e-commerce innovation, leading to the largest Wall Street IPO in history. The stock market, too, has undergone momentous loosening, with initiatives like Shanghai-Hong Kong Connect permitting investors on both sides to invest in the other market, subject to quota limits. Clearly the economy is changing towards slower but more market-oriented and innovative growth. But China remains a huge work-in-progress. The recent market clash had been waiting to happen for some time. The massive demand of ordinary savers and investors to seek higher yields in a yet-to-fully-open financial system with interest-rate suppression mismatches the less-than-mature prudential system. Many companies have been taking advantage of this mismatch to deliberately restrict the volume of shares for market manipulation. There may also be some hedge funds or speculators hiking up prices in order to short the market. Shadow banking may also have played a part. This has led to ridiculous rapid swings in share prices. Beijing knows this but was caught off-guard with the ferocity and rapidity of the roller-coaster. To prevent Armagedden, the leadership has seized the moment and vows to give what it takes to stabilize the market. The robust backing has led to a temporary rebound. Both Beijing and the mass investors, many having their fingers burnt, have learnt a big lesson. In future, Beijing is likely to redouble efforts to enhance her market prudential system, including perhaps mandating automatic suspended trading when volatility breaches certain preset limits, pending immediate investigation of any market irregularities. But as my earlier analysis shows, it is too fast to jump to the conclusion that China's reform is stalling, or worse, as David Shambaugh claims, that the One Party regime is heading towards twilight, if not immediate collapse. Meanwhile, however, Q2 GDP outturn is better than expected, although outlook for GDP growth in 2015 appears dimmer, according to forecast by BBVA, a Spanish banking group. China's stock market crash reflects a closed economy? China's stock market size is 1/3 of GDP, compared with generally over 100% in advanced countries. Stocks represent less than 15% of China's household assets. They account for less than 1.5% of total banking assets. Notwithstanding the 30% market drop, average share prices are still up 75% compared with last year. My live TV interview on The World with ABC (Australian Broadcasting Corporation) at their London studio on Thursday 9th July, 2015. As for political and socio-economic implications, please visit my concurrent analysis "Bloodbath in China's stock market belies reform agenda?" 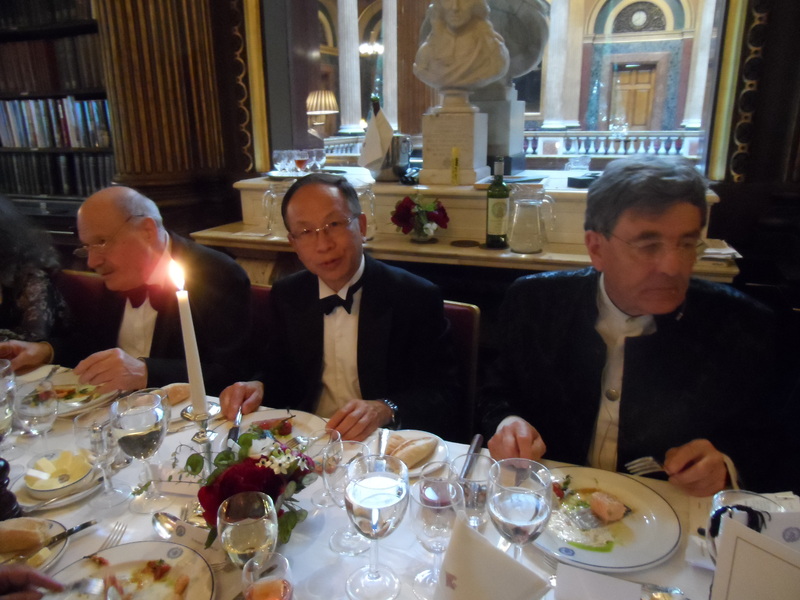 My PowerPoint presentation at a black-tie dinner on 8th July, 2015 at the Reform Club, Pall Mall, London as Guest Speaker for the evening. N.B. 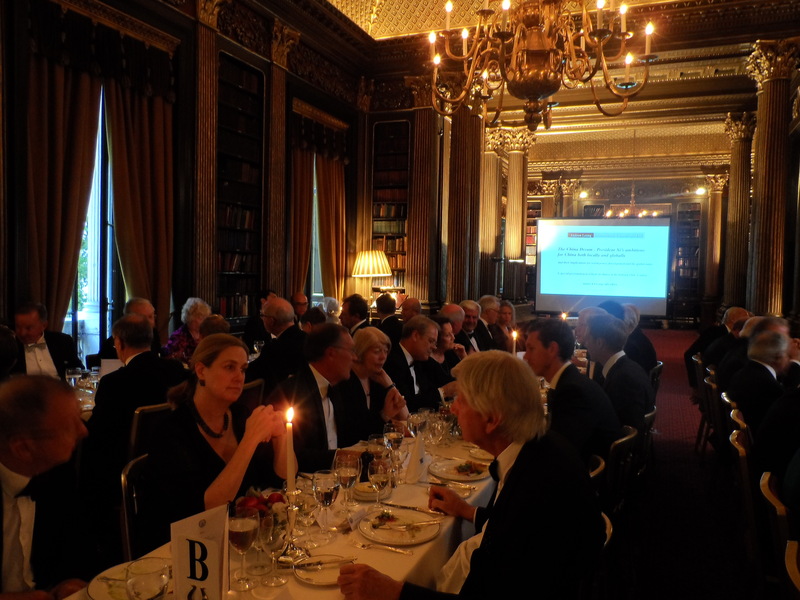 The Reform Club's recent dinner Guest Speakers included Herman Van Rompuy, President of the European Council. Possibly speaking later in the year will be Mm Christine Largarde, Managing Director of the International Monetary Fund (IMF). My PowerPoint presentation at the National Liberal Club, 1 Whitehall Place, London on 29 June, 2015 as the Guest Speaker at the National Liberal's AGM.